February is back, and how glad I am to see it. 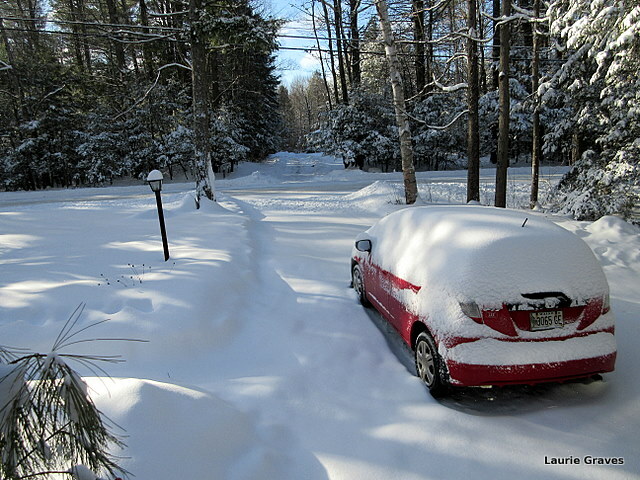 Yesterday, we got four inches of light, fluffy snow that will be easy to clear. Readers will be happy to know that Clif and I came home from doing errands just as the first snowflakes started falling. While leftover soup heated, we put away our groceries and other sundry items. Then, as we ate our soup—spicy squash with chicken sausage—we watched the snow come down, down, down. So lovely to watch when you’re snug at home with a bowl of hot soup to eat. As I have indicated in previous posts, I really like winter—December, January, and February. I was born in central Maine, in September, which means my earliest memories involve snow and cold. I can remember having my picture taken on the mailbox of our new house, the first for my parents, who came from poor families and were rightly proud of their little home. I must have been two or three, and I am bundled in a winter coat, mittens, and a brown fuzzy hat. I remember squinting because the sun was in my eyes, but I don’t remember feeling cold. In fact, as a child, I do not ever remember feeling cold. My mother, who was very attentive, made sure I was warmly dressed, and out I went to play. I skated, I went sliding, I dug snow caves, and I had snowball fights with other children in the neighborhood. No doubt I came in with red cheeks, but I was never uncomfortable. Even now, I do not mind the cold, and because of this, I love and appreciate the look of winter. 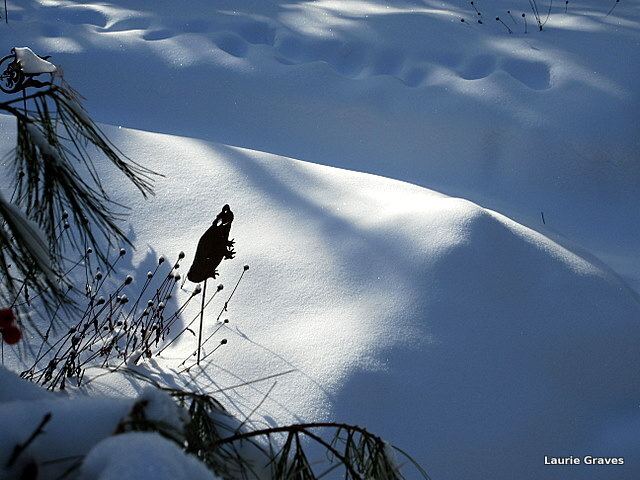 This morning, after the little storm, our yard was filled with blue shadows and glittering snow. 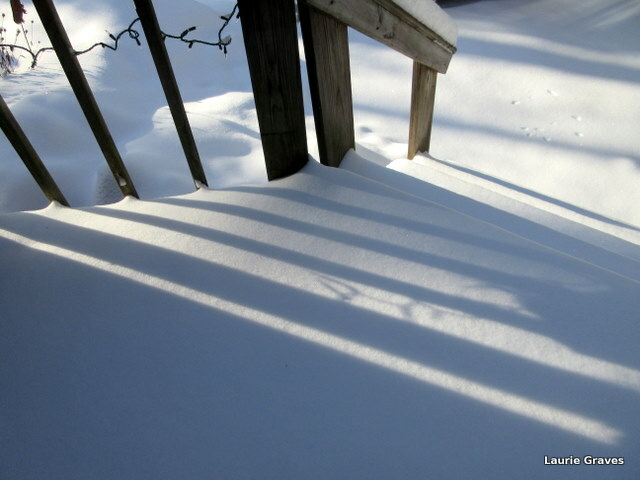 Even our porch had blue-slanted shadows across it. And, as Clif put it, the car looked like a marshmallow puff. 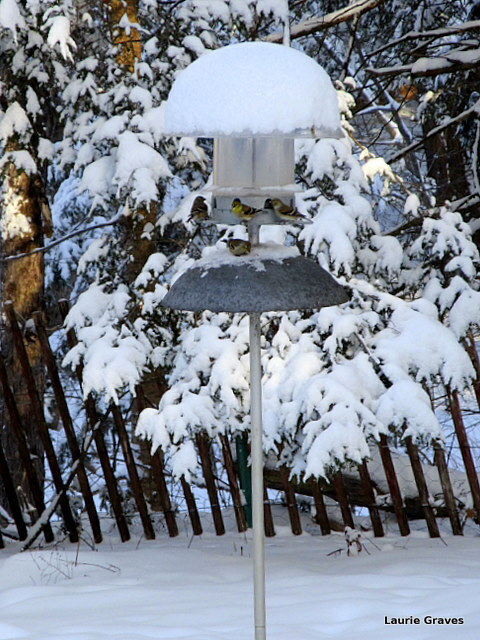 In the backyard, goldfinches crowded the feeder, and they twittered as they ate. 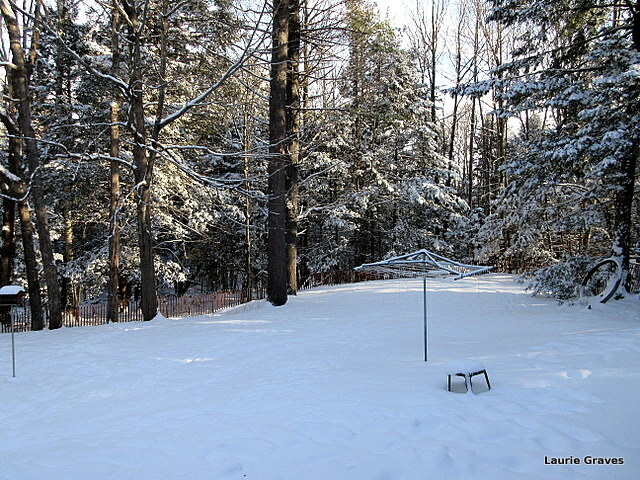 The clothesline will not be used for another few months, not until April, when I will happily begin hanging out quilts and blankets and the rest of our laundry. Until then, I will enjoy the beauty of winter, the cold and the quiet and the blue shadows. Thank you of sharing your appreciation of winter. That’s it; we don’t have a winter in Sydney. We can use our clothesline all year round. Today’s maximum will be 28ºC, that is 82ºF. Thanks, Judy! You got a little more snow than we did. Funny when that happens. Oh, yes. Winter is a blessing . . .
Mon pays ce n’est pas un pays, c’est l’hiver…, sang Gilles Vigneault about Quebec; though I don’t live in la belle province, for me a country is many things and many places and many times . . .
Beautiful! I love snowfalls like that when they happen on a Friday, so that I have the weekend to enjoy it and ‘dig’ out. 🙂 My son was born in Wpg (I was not), and he just loves winter, much like you describe. I enjoyed this post! Thanks so much! Like me, your son grew up knowing winter. Thanks, Johanna. Gray days can be hard. Hope the sun shines soon. Our goldfinches have been very active, too. I sprinkled some extra food on the ground near the feeders after the snow and I think all the birds in the neighborhood have been by. The snow provides such a lovely background for bird watching. It certainly does. I, too, sprinkle extra food on the ground near the feeders. And, I love the twittering sound the finches make when they are at the feeder.